Even though I had to work on Friday, I managed to pick up my travelling companion and to be on the road to Yakima by 3 pm. I arrived at the Running Springs Ranch in Naches, WA outside of Yakima shortly after 6 pm. I found a parking spot, and ran into a fellow bigfooter from Oregon whom I had "met" online, but never met face-to-face. Together, we made our way towards the tents and groups of people we observed milling about near a large barn. Ranch is a very large piece of land with a small creek flowing through it, expansive pasture land, a large pond, and several outbuildings. It is obviously a working ranch, with many horses, cows, wagons, and lots of people continuously dropping by. 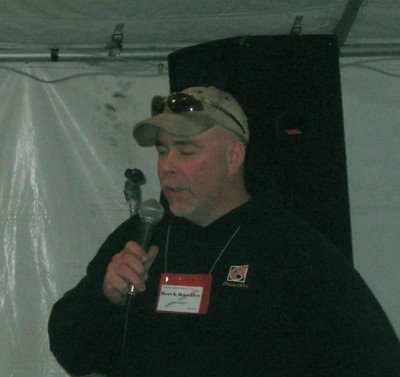 The hosts were gracious and friendly, and happy to have the bigfoot crowd as guests. It took me a while to make my way to the check-in table due to seeing so many familiar faces, but eventually I picked up my name tag and proceeded to catch up with the many friends I had not seen for many months. As the sun sank lower and the temperatures became a little more reasonable, the first speaker took the stage. Bill Munns has over 40 years of experience with special effects and costumes in Hollywood, as well as extensive knowledge of robotics, taxidermy, and museum-quality models of animals. He has been aware of the Patterson/Gimlin Film since 1967, and, as he noted in his address, has always had the nagging observation that the hair of the creature in the film does not move, nor look like, a hair suit. There is a formula in physics that states the relationship between four variables: the height of the subject, the height of the subject on the film frame, the distance to the subject, and the focal length of the lens. Since three out of four of these measurements are known for the PG film, at various points, the unknown (Patty's height) can be solved using simple algebra. At the previously assumed 25 mm focal length, her height is around 4.5 feet. Using the 15 mm lens, she stands close to 7.5 feet. Bill later goes on to prove that the lens was in fact a 15 mm focal length lens using software that builds virtual models using a set of data points. Bill has published his findings in a 57 page report that can be found on his newly published website here: http://www.themunnsreport.com/index.html. 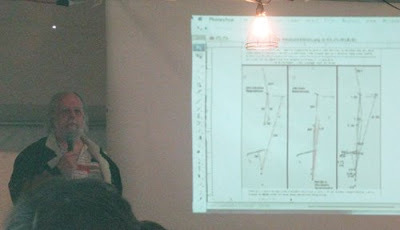 Bill gave tantalizing hints about his further study of this piece of footage, as well as his hunt for humans that have similar body length indices to those exhibited in the film. He will continue to publish his findings in hopes that others with similar expertise will examine them, and try to come to their own conclusions. Bill Munns with three filmsite maps. Speaking to Bill after his presentation, I was struck by his down to earth attitude, and his adherence to the scientific process. 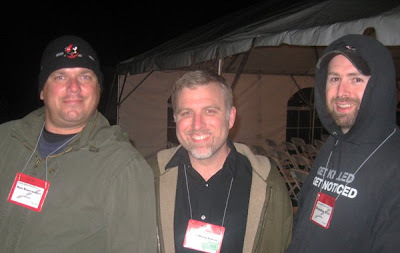 He has no stake in this game, and clearly said that he was the "new kid on the block" in bigfooting, and humorously that he has never been to a bigfoot conference, nor any other gathering with the word "bigfoot" in the title. All of his data is available on the above website, and he invites anyone to run the numbers for themselves. Bill's conclusions are not a matter of opinion, but rather of the physics of optics, and of mathematics. Scott Nelson spoke about his study of the Sierra Sounds vocalizations. Scott is a retired Navy Crypto-linguist. He has been extensively trained by the military in deciphering codes and languages used by governments in espionage. He has run the vocalizations through software looking for patterns, and claims to have found some. He has identified phonemes and repeatedly articulated patterns of sounds that he says indicates the presence of language. He also notes the speed of the vocalizations, as well as the speed of the interactions between the multiple creatures on tape. Derek Randles was the next presenter. 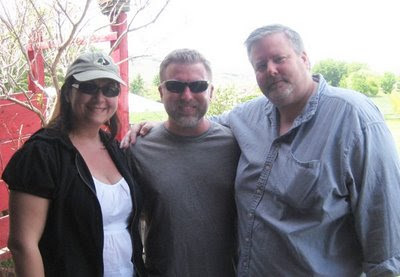 Derek has researched bigfoot since the mid 1980's, but keeps a very low profile. His name is mostly recognized by his co-ownership of the Skookum Cast, being one of the three individuals to find the impression. He is currently a member of the BFRO, but has worked with Dr. Meldrum's North American Ape Project, and has done extensive independent investigations as well. He is a good tracker, enthusiastic hunter, and one of my favorite field partners. For the last several months, he has been working on what he calls The Olympic Project. Derek suspects that sasquatches use ridge lines to navigate quickly over great distances as other apex predators do. To those ends, Derek, with the support of the BFRO and Wally Hersom, has initiated a trail camera study using the Reconyx RC60 IR camera. 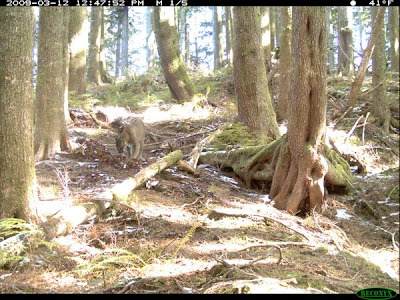 He has over two dozen of these cameras placed on remote ridges throughout the Olympic National Forest. Basically, Derek hikes in (off trail) to remote ridges, finds choke points, deploys between two and five cameras along obvious travel paths, and comes back a month or two later to look at the results, change batteries, and start the process over again. Having accompanied Derek on one of these excursions, allow me to say that I deeply admire Derek's commitment to the project and his research. These off-trail forays into the Olympic brush are physically taxing, often wet, and demanding of time and monetary resources, most of which come from Derek's own pocket. 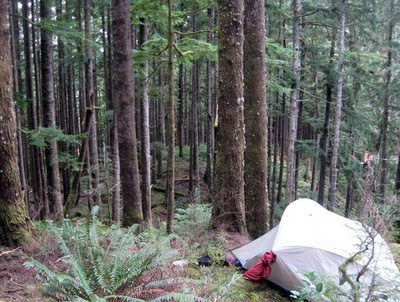 My tent on a remote ridge during one of Derek's Olympic Project trips. The Olympic Project is still fairly new, but already the results are very promising. Derek routinely captures images of mountain lions and bears, as well as smaller predators like bobcats. To capture any mountain lion photographs is an accomplishment in itself, but Derek often finds them on his cameras' memory cards. The rest of the night was spent socializing with old friends, as well as new ones. Time flew very quickly, but eventually the exhaustion, sunburn, and beer drained me of all the built-up adrenaline, and I retired shortly after 3:30 am. Oh yeah, and just a follow up on last night's visit with Thom Powell... We took the drive to the Clackamas River Project site and walked around in the woods until nearly 4 am with the thermal imagers. Nothing bigfooty happened, but that's squatching! Sounds exciting. Good luck. Those RC60's are definitely the camera for the job. They fire so quickly the The Squatch won't know what hit him.